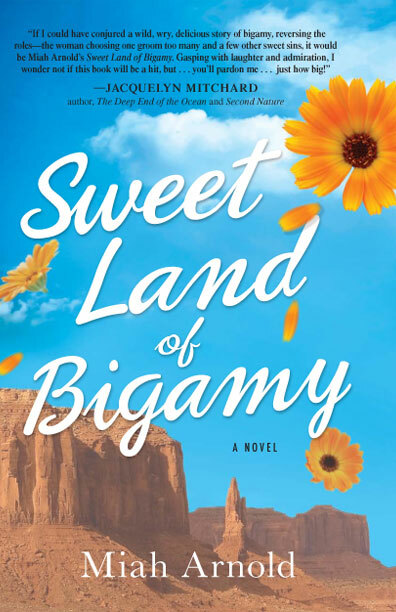 Miah Arnold, Author of Sweet Land of Bigamy. As a child, I lied continuously. I told the new students at Myton Elementary I could talk to insects, I said that I knew by first name every single cricket, mosquito, horsefly, butterfly, or moth in town. I can also clearly recall telling a boy named Rowdy I was one of the children singing “We don’t need no education…” in Pink Floyd’s The Wall and I can still feel the burning intensity of my indignation when he didn’t believe me. In third grade I fell in love with a strapping, popular, young farm boy named Geoffrey. As in every great love story, there was a hitch: everybody in class, including Geoffrey, hated me for a multitude of reasons that are probably not unique in essence, but unique to the specifics of rural Utah: Mormons hated me as the daughter of the owner of the Three Legged Dog Saloon; Utes hated me as a white girl; girls hated me not because I was motherless, but because it showed in my uncombed hair and ratty clothing; and the boys, of course, hated me equally because the girls did and because I was a girl. I was also, maybe, the richest girl in a town where eighty-five percent of the people lived far below Federal poverty levels. My personality did not make up for my shortcomings: I was introverted and afraid to talk about most anything I saw at my home behind the bar (literally, my house was attached to the saloon) because there were always rumors the Mormons were trying to take me away from my father’s tainted world. When I did talk, as I’ve already confessed, I was partial to pretending. It therefore took some real thinking, on my part, to sway dear Geoffrey’s estimation of me into a more becoming light, and my eight-year-old sensibility guided me in the right direction: I told him that I had little bags of candy made for each person in class, and that at the end of each day, depending on how nice people were to me, I added bounty to the loot. “Your bag is already the fullest,” I told him, and we became good friends. By mid-year it so happened that only two people in school had any candy at all in their bags: Geoffrey and a girl named Alecia (she was a year older, despised for her Jehovah’s Witness upbringing). To keep jealousy at bay, of course, I told Geoffrey that while Alecia’s candy was contained in an Albertson’s paper grocery bag, his had nearly filled an entire Hefty garbage sack. For the class picnic we rode the bus to some person’s farm, and the principal’s daughter, Sonya Taylor, passed around what she called a “Slam Book”—a notebook in which every student in class had a page. Sonya had written our names out at the top of the pages ahead of time and our job was to write what we really thought about everyone in the class, anonymously, beneath their names. The book didn’t circulate to me until most everybody else had signed. Before adding my own input, I turned to my page to see how I’d fared. On line one Sonya—it had to be her, it was her book—wrote Full of Baloney, and nearly everybody else in class repeated the same words. There were twenty-eight Full of Baloneys and one nice thing written about me: The nicest girl in the whole school. I knew Geoffrey had written it because he had ignored Sonya’s anonymity rule and signed his name next to it. You might call Geoffrey merely a dunce, and I, merely a liar, but that’s not the heart of the story. For Geoffrey’s part, what if he was a boy who liked hearing somebody tell him stories? He stayed with my story of the bags of candy through the third grade, and into the fourth, when I moved in with my father’s new wife inSalt Lake City. It had been a glorious idea, this bag of mysterious candies, and that was enough for him. Though I told lots of stories as a child, I hadn’t considered myself a liar (or a storyteller), and I was surprised that the class considered me one. I couldn’t remember lying because there was a part of me that really was making a bag for Geoffrey and Alecia—I spent nights plotting how I would sneak into my father’s bar while he slept, and how I would steal the Babe Ruth’s and Wrigley’s Spearmint gum from him. I fretted about the lack of variety available to me. And though it’s true I couldn’t talk to insects, I really wanted to. Friendless as I generally was, I wanted to enter the world of imagination, to enter that community where I might be understood and appreciated. My being full of baloney, then, was my being full of hope, I think, or of better ideas about who I was than what the people around me would offer. Full of baloney was being aware of the extent of my own potentiality. My stories said: I am not who you think I am, I am not a person living in the world you live in, I am going to grow up and go away and live a life you all could never imagine. You’ll see you were wrong about me, you’ll see that I can dazzle you, no matter how revolting I appear to you now. Gemini Wahhaj has a PhD in creative writing from the University of Houston. Her fiction has appeared in Granta, Cimarron Review, Crab Orchard Review, Night Train, and Northwest Review. At the University of Houston, she won the Inprint/Michener Fellowship in Honor of Donald Barthelme for 2004-5. She also received an honorable mention in Atlantic Monthly's student fiction contest in 2005 and in Glimmer Train's fiction open contest in 2009 and was a finalist in Glimmer Train's short-story award for new writers in Spring 2005. She was a panelist at several AWP conferences. She won the Phi Kappa Sigma Award for Best Fiction by an Undergraduate at the University of Pennsylvania in 1993, judged by Philip Roth. She is an associate professor of English at Lone Star Community College, North Harris and advisory board member at Inprint, a national literary organization. Gemini Wahhaj a member of SCBWI and part of a writers’ critique group. Zany Zahid Compares the book Hugo Cabret to Classic Movies. I’m Going to Talk About Flour Now, Because That’s How My Brain Works. Anthony Barone Says Most Kids Like to Read Books About Kids Who Save the World Because They Want to Save the World Themselves. Yes, We Are Talking About Maximum Ride! Put on Your Seatbelts and Get Ready!